Background Diabetes mellitus is recognized as a major public health issue and is one of the top ten causes of death in Qatar. Objective To describe the activities, and attitudes of Qatar pharmacists toward diabetes, to measure their diabetes knowledge and to assess their perceived barriers for diabetes care. Setting Community and ambulatory pharmacies in Qatar. 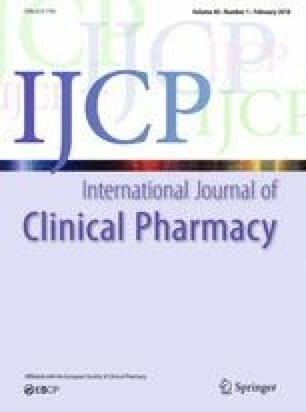 Method Study objectives were addressed in a cross sectional survey of community and ambulatory pharmacists in Qatar. A phone call explaining the study was made to all community and ambulatory pharmacists in Qatar. Consenting pharmacists anonymously completed the survey either online or as paper. Main outcome measure Diabetes related activities, knowledge, attitudes and perceived barriers. Results Over 7 months, 126 surveys were collected (28% response rate). The majority of pharmacists always or often counselled patients on the appropriate time to take each medication and on medication side effects (90%, n = 100/111 and 73%, n = 81/111 respectively). Yet around 50% always or often provided education on the importance of screening for nephropathy (n = 59/112) and retinopathy (n = 58/109). In addition, 41% always or often provided education about the importance of immunization (n = 45/111) and 45% always or often provided therapy recommendations to physicians (n = 49/111). Using Diabetes Attitude Scale-3, most respondents had positive attitudes toward the need for special training, psychosocial impact of diabetes, and patient autonomy. Around 25% (n = 32/126) scored less than 6 out of 10 on the diabetes related knowledge test. The top three barriers for providing diabetes services were lack of time (53%, n = 67/126) shortage of personnel (42%, n = 53/126) and lack of private counseling area (42%, n = 53/126). Conclusion Qatar pharmacists mainly provide basic services for diabetic patients. They have an average diabetes related knowledge. Yet overall, they have positive attitudes toward diabetes, which is a vital component of any successful diabetes care service. We would like to thank the pharmacists who answered the survey. This publication was made possible by a UREP (Undergraduate Research Experience Program (UREP) award [UREP 10 - 032 - 3 - 008] from the Qatar National Research Fund (a member of The Qatar Foundation). The statements made herein are solely the responsibility of the author[s]. The World Health Organization, International Diabetes Federation. Diabetes action now. http://www.who.int/diabetes/actionnow/en/DANbooklet.pdf (2004). Accessed 5 May 2017. The World Health Organization. Global report on diabetes. http://apps.who.int/iris/bitstream/10665/204871/1/9789241565257_eng.pdf?ua=1 (2016). Accessed 5 May 2017. IDF Diabetes Atlas. 7th ed. http://www.diabetesatlas.org/.Accessed 5 May 2017. Cassels C. Poor diabetes management continues to leave millions at risk. http://www.medscape.com/viewarticle/539028 (2006). Accessed 5 May 2017. National Diabetes Education Program. Redesigning the health care team: diabetes management and lifelong management. https://www.niddk.nih.gov/health-information/health-communication-programs/ndep/health-care-professionals/team-care/Documents/NDEP-37_508-2.pdf (2013). Accessed 5 May 2017. The International Diabetes Federation. International Standards for Education of Diabetes Health Professionals. https://www.idf.org/e-library/education.html (2015). Accessed 13 Oct 2017. The IDF Diabetes Atlas, 7th ed. Qatar country report 2015. http://reports.instantatlas.com/report/view/846e76122b5f476fa6ef09471965aedd/QAT (2015). Accessed 5 May 2017. World Health Organization. Qatar diabetes country profile. http://www.who.int/diabetes/country-profiles/qat_en.pdf?ua=1 (2016). Accessed 5 May 2017. Diabetes Attitude Scale formula. http://diabetesresearch.med.umich.edu/peripherals/profs/documents/svi/das3_score.pdf. Accessed 5 May 2017.